Q. Where is the manufacturer located? 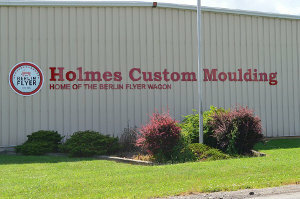 Holmes Custom Molding is located just outside of Berlin, Ohio. 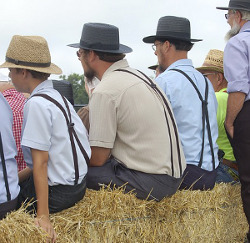 Berlin is in Holmes County which contains the largest concentration of Amish in the country. Full of shops and attractions in easy walking distance, Berlin is a popular tourist destination. A few miles outside of Berlin are rural Amish countrysides. Q. Are Berlin Flyers made by the Amish? The owner comes from an Amish background. As an Amish boy, he spent much of his teen years working in a woodshop. While no longer Amish, the values and skills he learned as a boy are passed along to his family and business. Most of his employees are Amish, and oversee the various processes of making the Berlin Flyers. Q. Who are the Amish? The Amish are close-knit communities of people, known for denying themselves many of the modern conveniences at an attempt for a humble and simple lifestyle, as dictated by church leaders and years of tradition. They are very family oriented and known for their good ethics and work values. They are recognized by their plain dress, horse drawn buggies, beards on the men, and bonnets on the women, and their well kept farms. Q. Are Berlin Flyer wagon parts American made? 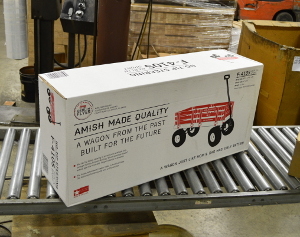 Yes, the wood and steel parts used in the wagons come from local mills. The only exception are the tires. Q. Will my Berlin Flyer come assembled? No. However, assembly is very easy, using tools commonly found in the household. With the exception of the Loadmaster F600, the assembly manuals have been recently updated for detailed, easy to follow instructions. Estimated time to assemble is 20 - 40 min. An easy project for you and your son or daughter. Q. What accessories are available for the Berlin Flyers? Currently, we only stock accessories to fit our mid-sized wagons, the All Terrain F410 and the Original F310. We carry pads that can stretch out to cover the wagon bottom or that can fold as a seat with a back. Also available are railing pads and railing side pockets. Most accessories are available in the red, polka dot, and camouflage color options. Q. Which berlin flyer model should I buy? That is really up to you. The differences between the different models have to do with body size and wheel type. 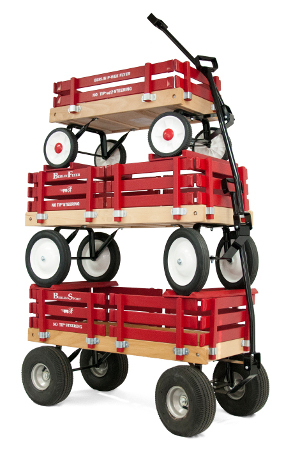 The PeeWee and Bigfoot are our smallest wagons, meant for toddler ages. The P-Wee has hard rubber tires that do not flatten, the Bigfoot has larger, inflatable tires that provide a smoother ride. Both are ideal for little kids to pull around with the Bigfoot being more appropropriate for rough terrains. The Original and All Terrain Sport wagons are our mid sized and mid priced models. They can seat two toddler sized kids comfortably, with the All Terrain Sport having the all terrain wheels. Please note that all wagon accessories are made to fit only these wagons. Lastly, the Loadmaster is our largest model. With about 5" more width and length added to the wagon bed, you should be able to seat three toddlers. The Loadmaster also has an extra support rod, enabling it to withstand as much as 500 pounds. Great for an extra heavy duty farm wagon or yard wagon.